TOKYO -A volcano in southern Japan that appeared in a James Bond film had its biggest eruption in years Tuesday, shooting smoke and ash thousands of feet into the sky and grounding dozens of flights at a nearby airport, officials said. The Meteorological Agency said the Shinmoedake volcano on Japan’s southernmost main island of Kyushu erupted violently several times, and some lava was rising inside a crater. Public broadcaster NHK showed gray volcanic smoke billowing into the sky and orange lava rising to the mouth of the crater. The Meteorological Agency said ash and smoke shot up about 7,500 feet into the sky in the volcano’s biggest explosion since 2011. In Kirishima city at the foot of the volcano, pedestrians wore surgical masks or covered their noses with hand towels, while others used umbrellas to protect from falling ash. Cars had layers of ash on their roofs. There were no reports of injuries or damage from the eruptions. 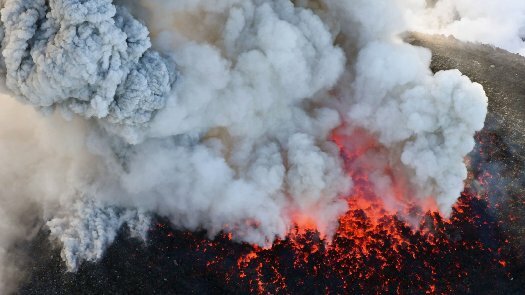 The agency said the volcanic activity is expected to continue and cautioned residents against the possibility of flying rocks and pyroclastic flows — superheated gas and volcanic debris that race down the slopes at high speeds, incinerating or vaporizing everything in their path. The volcano, seen in the 1967 James Bond film “You Only Live Twice,” has had smaller eruptions since last week. Entry to the 4,660-foot-high volcano was restricted. About 80 flights in and out of nearby Kagoshima airport were canceled. Japan, which sits on the Pacific “Ring of Fire,” has 110 active volcanoes and is prone to earthquakes and volcanic eruptions. An eruption of Mount Ontake in 2014 killed about 60 people. In January, a surprise eruption of another volcano in central Japan killed a soldier during ski training and injured 11 others. Several other Japanese volcanoes have had smaller eruptions.